It's been a long time between entries ... that will probably change once the second hull is turned and the work becomes less repetitive. 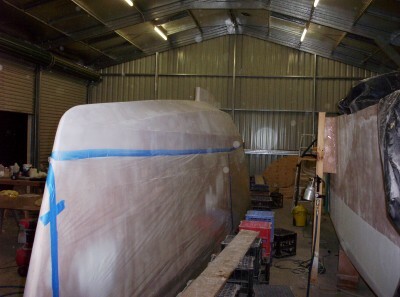 After what seems like an eternity, the second hull is finally ready for some paint. "Filling and Fairing" really seems to take for ever, especially when working full time as well. Perhaps it's the process I'm using: first coat is put on with a knotched trowel. This is sanded with #40 grit to provide a relatively fair surface. Then, the grooves are filled in with filler, and that's sanded. In theory, it should end there, but the stuff seems to shrink a bit, or perhaps it's the broadknife I use to apply the filler. Anyway, it usually takes 4, 5 or even 6 applications of filler, with a sand in between, #60 grit. It all then gets a final sand with #80 paper, and the chines all get rounded. I do it all by hand, which is good exercise, but probably not much slower than using a board attached to an air driven sander. Rotary sanders are out of the question, except for doing major clean up work early in the piece. It's easy to become a perfectionist, trying to get the chine lines absolutely fair. Even a couple of millimetres seems to stand out. However, I'm probably the only person who'll ever know/notice/care, especially since they go underwater whey the boat gets launched anyway!